Wow! What another great convention we had last November! If you missed it and would like to read the abstracts, ‘read more’. And we hope to see you next year at TESOL Italy’s 44rd National Convention! TESOL Italy’s new professional development course led by Donald Freeman for the training of teacher trainers in cooperation with Romatre and the University of Michigan School of Education is underway! For Moodle access click on the E-learning ‘green’ board below. 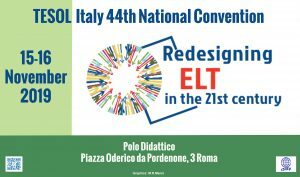 TESOL ITALY’S 42nd National Convention 2017 in Rome was a great professional experience. If you missed it and wonder what it was about, take a look at the program booklet. Fifty years ago, TESOL became a professional association based on the core principles of individual language rights, respect for diversity, multiculturalism, multilingualism, and inclusivity. What an exciting two-day teacher development event it was! For a description of the themes, download the Call for Papers here. Share it with your colleagues!